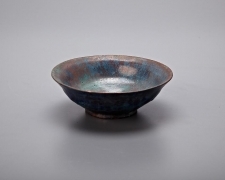 This small bowl was made at one of the historical Royal Delft factories in 1910. It is irregularly covered with blue, green and pink glaze drops that suggest the influence of Impressionist paintings. 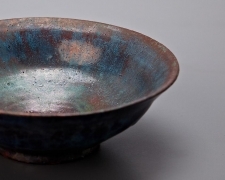 The application of colorful glaze against a dark background painted in a brownish glaze reinforces the impression that the space of the bowl is treated like a painter’s canvas. Its smooth and shiny surface, as well as its perfect dimensions, makes it an exquisite piece of earthenware. A mysterious element of the bowl is the Pi symbol painted under the bowl’s foot, below the Delft inscription. 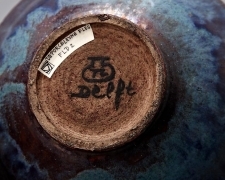 Marks: Delft, Apothecary jar with pi symbol inside.